1B Umpire Brian O'Nora ejected Rays Manager Kevin Cash for arguing an out call in the bottom of the 3rd inning of the Royals-Rays game. With two out and three on, Rays batter Logan Forsythe hit a 0-0 changeup from Royals pitcher Edinson Volquez on the ground to shortstop Alcides Escobar, who threw to first baseman Eric Hosmer as Forsythe arrived at first base; the play was not challenged because the Rays unsuccessfully attempted to challenge an out call in the 1st inning. Replays indicate Forsythe's foot made contact with first base prior to Hosmer catching the ball, the call was incorrect. At the time of the Royals were leading, 3-2. The Royals ultimately won the contest, 3-2. This is Brian O'Nora (7)'s first ejection of 2015. Brian O'Nora now has 0 points in the UEFL Standings (2 Previous + 2 MLB - 4 Incorrect Call = 0). Crew Chief Jeff Kellogg now has 3 points in Crew Division (3 Previous + 0 Incorrect Call = 3). This is the 184th ejection of the 2015 MLB Regular Season. This is the 87th Manager ejection of 2015. 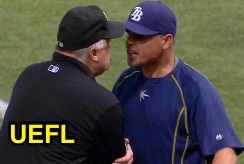 This is the Rays' 5th ejection of 2015, T-4th in the AL East (TOR 10; BOS 9; NYY, TB 5; BAL 4). This is Kevin Cash's 3rd ejection of 2015, 1st since May 10 (Mike Estabrook; QOC = Y [Check Swing]). This is Brian O'Nora's first ejection since June 23, 2014 (Bud Black; QOC = Y [Replay Review]).